Fast [the month of Ramadan] so that to heal your bodies from diseases," says a Hadith, or saying of the Prophet Mohammad (saas). Weight gain could be seen as one of these diseases. However, to lose weight during Ramadan fasting must be done in a very careful manner. There are many ahadith that give us advice on how to eat healthy while fasting during Ramadan. However, people often forget these healthy eating habits during Ramadan. Ironically, as well, there are more "eating traps" during Ramadan than any other month. So, as we struggle to be good Muslims and fast, we may inadvertently be straying from the path of the Prophet by breaking all rules of good health. The most common "Ramadan pitfalls" are: Eating a large iftar (meal at breaking of fast) right after the Maghrib azaan (sunset call to prayer), eating unusual or new foods, too many salty foods, too many sweet foods, increasing consumption of tea or coffee, not sleeping enough, skipping meals, eating too much bread or other foods, changing lifestyle habits, and reducing exercise. Eating a large iftar right after the azaan is not recommended in the Hadith. The large influx of food consumed after a day of fasting can cause the digestive system to "clog". For this reason it is recommended that Muslims break their fast on dates and water or a simple soup, perform the Maghrib prayer and then eat a moderate iftar. Ideally, another small meal should then be eaten after the Tarawih (evening prayers during Ramadan) prayers. Eating a large iftar can also be a problem because it can involve "trigger foods". Trigger foods are foods that cause people to desire more and more of the same food. Sugar is one popular trigger food. The opposite of "trigger foods" are "ideal foods". You can find out your trigger foods by observation or by visiting a naturopath. Everyone should know what foods they are allergic to, what foods are their "trigger" foods and what foods are their "ideal foods". Eating too much is an obvious pitfall to weight loss during Ramadan. The Qur'an says, "Eat of the good things we have provided for your sustenance but commit no excess therein" (20:81). Many people do not realize that they are eating more because they try not to. However, keep in mind that the rest of the year people usually eat a small breakfast, rush off to work or school and then eat a small lunch and a larger dinner. Then they sleep. In some cultures they eat a larger lunch and then a smaller dinner. In Ramadan, however, iftar tends to be quite large and eating can continue into the night with numerous visits to family and friends. The morning suhur (pre-fast meal) is often quite large as well. It helps during this time to keep an eating diary for a "reality check". I am sorry to say that most people in my practice that say they are not eating too much find out otherwise when they write it down. Eating new or unusual foods is also a problem for weight loss during Ramadan. In fact, making any lifestyle changes can be stressful and contribute to weight gain. Stress can cause weight gain in people that are susceptible to stress. If you are the type of person who does not like change and prefers that "everything has its place and everything is in its place" or you are happiest at home then you are probably a person who does not deal with the stress of change very well. Vitamin B complex vitamins can help people deal with stress. There are also many herbs that can help with stress. Eating new foods also increases the chance you may be allergic to something you are eating. The Prophet Muhammad (SAWS) said, "The stomach is the pool of the body and the veins lead to it. When the stomach is healthy, the veins convey health from it: When the stomach is ill, the veins convey illness." Foods you are allergic to can make your stomach ill, resulting in asthma attacks, hives and weight gain. There is now scientific proof that allergies or food sensitivities can cause weight gain. Many people have lost enormous amounts of weight by discovering their allergies and eliminating those foods from their diets. Common allergens are eggs, peanuts, milk, wheat, soy and many others. The types of food you chose to eat during Ramadan can also defeat your efforts to lose weight. If you eat too many salty foods your body will retain water and cause you to feel bloated. At the same time, a lack of water in the body causes the body to retain fat and other toxins more readily, as it does not have enough fluid to "flush" toxins out of the body. 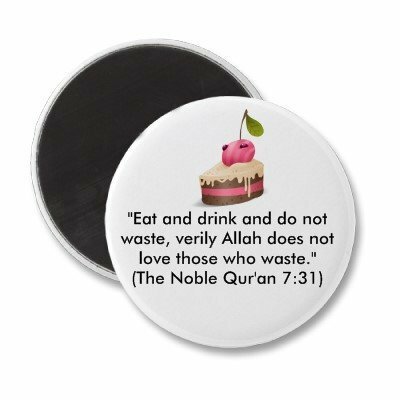 The Qu'an clearly states, "Ye people eat of what is on earth, lawful and wholesome" (2:168). If you eat too many un-wholesome foods, such as processed breads and sweets, you will gain weight. These processed and sugary foods are "trigger foods". These foods also leach nutrients from your body and thus cause your body to crave more food in general because it feels very unsatisfied. Eating too many breads and starches can also cause weight gain. Ramadan is often the time when women like to display and share their cooking abilities. Breads are usually considered the mark of a good cook and the way to display an inviting table to your guests. However, not everyone considers bread to be the height of good cooking. The books The Zone Diet by Barry Sears and the McDougall Plan by Dr. McDougall explains in great detail how starches and grains contribute to weight gain. The book Your Health...Your Choice by Ted Morter, MD goes into even more detail about bread, including how most grains and legumes, along with milk and meat, contribute to the acid environment in our body which promotes overall bad health. The best way to solve the problem of eating too many starches is to make sure you eat the right proportions from the various food groups to ensure weight loss. Imagine that you are preparing your plate with only vegetables and you are only allowed to use meat, milk, and grains as the condiments. Limit yourself to one cup of any given grain per meal and use meat and milk products as condiments. Start thinking of celery as something to spread peanut butter on instead of bread, think of carrot sticks with hummus instead of pita bread, and try a lettuce leaf instead of tortilla shells. Don't give up eating breads and meat, just de-emphasize them and save them for special dishes only. Your goal should be to consume about 70% vegetables (and fruits, but less of them) and 30% grains, beans, milk products and meat. There is also an entire category of foods that contribute to weight loss because they are "bitters" or contain a high percentage of water. As a rule any herb or food that is bitter helps move fats through the system faster and more efficiently. You must still eat these foods in moderation and correct proportion. They are not foods you can eat unlimited amounts of. Bitter and watery foods include: amaranth, quinoa, oats, corn, rye, adzuki beans, cucumber, zucchini, summer squash, sweet potatoes, celery, asparagus, kale, brussel spouts, cabbage, and other sprouts. You can also cook with spices that help speed your metabolism. These spices include: cardamom, cayenne, cinnamon, ginger. Discontinuing exercise can also cause weight gain during Ramadan. Most people reduce their workloads in some way stating "It's Ramadan so I should rest." For most people, this is untrue. If you have an unstable health condition the stress of fasting may mean that you should be careful. However, if you are so unhealthy that you cannot lead a normal life during Ramadan then you should not be fasting anyway. We need to exercise to pump blood and lymph through our bodies. The heart pumps blood but the feet and legs pump the lymph; and the lymph glands are what help us process and get rid of excess fats and toxins in the system. To really get the lymph flowing you need to have a good twenty minutes of NON-stop brisk walking. However, remember that exercise alone may not help some people lose weight so don't get discouraged if it does not help you. Keep in mind that you should not overwork and that moderate exercise will at least help you keep up your motivation to do the other therapies! Using some herbal teas instead of coffee and tea can also assist in weight loss. I recommend using "single" mixtures or weight loss mixtures that have been tested for hundreds of years and are still in use. Many herbal weight loss formulas on the market have been tested thoroughly, but only for short periods of time. There is a growing pressure to create new formulas all the time, so as a result many weight loss formulas on the market now have not been tested for long-term effects to organ systems; many contain shocking mixtures of various herbs that do not combine well. Secondly, each person is unique depending on their physiological type as well as their lifestyle and their unique allergies or health conditions. A tea which may help one person lose weight may cause another to gain weight. A professional herbalist, when creating a program for you will consider the herbs of oat straw, dandelion, alfalfa, fennel, fenugreek, milk thistle, and other herbs that cleanse the liver or lymphatic system. The herbalist may also recommend using some essential oils in a bath or massage such as juniper, bergamot, citrus oil, rosemary, or sage oil. Not eating enough can also be a surprising cause of weight gain. Not eating Suhur triggers a starvation response in your body, which actually slows down your metabolism for the rest of the day. This is like putting all that food you are eating on "slow motion" instead of "fast". If you skip breakfast your food will metabolize sluggishly in your system and contribute to your weight gain. Taking vitamins during Ramadan may also cause weight gain. Vitamin D supplements or Multi-vitamins contribute to weight gain. Many people think that since they are not eating the foods they are used to during Ramadan that they should take a vitamin "just in case". Vitamins should never be taken for that reason and should always be recommended by a health care professional. Vitamins can cause damage to organs, malnutrition or other health problems when taken inappropriately. Last, but not least, remember that Ramadan does not have to be the time of year to lose weight. Don't focus on losing weight this Ramadan. Focus on the meaning of Ramadan, follow the tenants of good health recommended by our Prophet and you will find the weight will come off.